Traditional Japanese woodblock prints are gorgeous works of art that continue to inspire and amaze, even centuries after their creation. The process of creating a woodblock print was actually adopted from the Chinese. This process was extremely meticulous and time-consuming, require the artist to carve out all the negative space of their desired images into their piece of wood. They would then cover the block with paint. Lastly, the block was pressed to paper or textile, like a stamp, and the reverse image was produced. One of the most famous Japanese woodblocks is The Great Wave off Kanagawa (1830). This piece was part of a series by artist Katsushika Hokusai, all depicting Mount Fuji. In Japanese culture, ocean waves were considered protective for their country. Hokusai saw them as especially important because they were the hero that would separate them from the rest of the world. Japan was kept safe from foreign invasion or influence because of their nearly impassable rough seas. 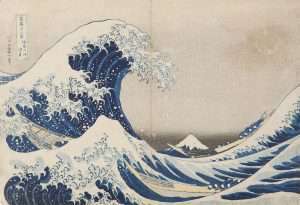 In The Great Wave off Kanagawa, however, Hokusai plays with the traditional notion of waves as protection. Instead, the massive wave appears imposingly over the country and could be symbolic of the foreign forces that threatened to overpower the island country at the time. The wave stands larger than Mount Fuji, demonstrating that not even Japan’s most famous mountain can be safe from the threatening forces. Look closely and see if you can find the tiny fishing boats in the water that are trying to fight it, but it is also taking over them. Nothing is safe from what is coming. Katsushika Hokusai (1760-1849), Under the Wave off Kanagawa, from Thirty-Six Views of Mount Fuji, c.1830-32, woodcut, 10 x 15 inches. Brigham Young University Museum of Art, purchase/gift of the Mahonri M. Young Estate, 1959.